Comparison of volume-averaged FIO2 by using Subject MRI2, with a mean volume-averaged FIO2 across 15 airway replicas. Data for both pulse deliveries from a SimplyGo portable oxygen concentrator and continuous flow oxygen from a stationary source of compressed oxygen are included. Error bars indicate ±1 SD. Commercial portable oxygen concentrators tested in this study. 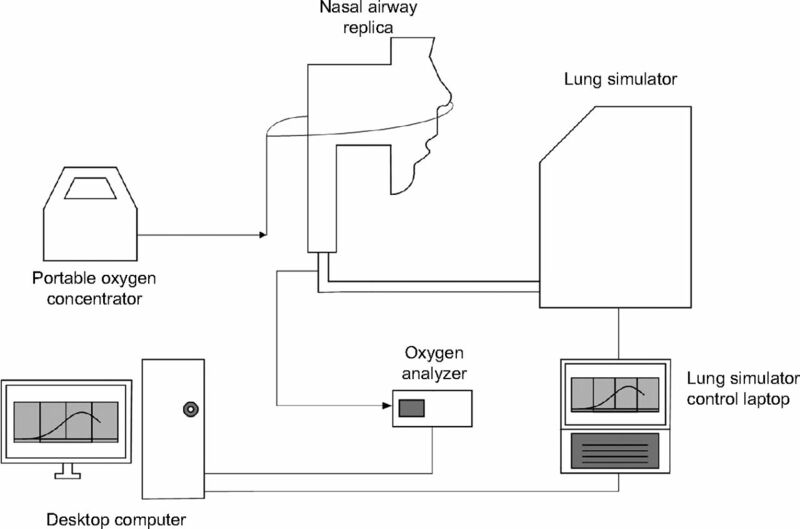 Schematic of apparatus used in experiments that involve airway replicas. Arrows indicate direction of oxygen flow. From Reference 10, with permission. 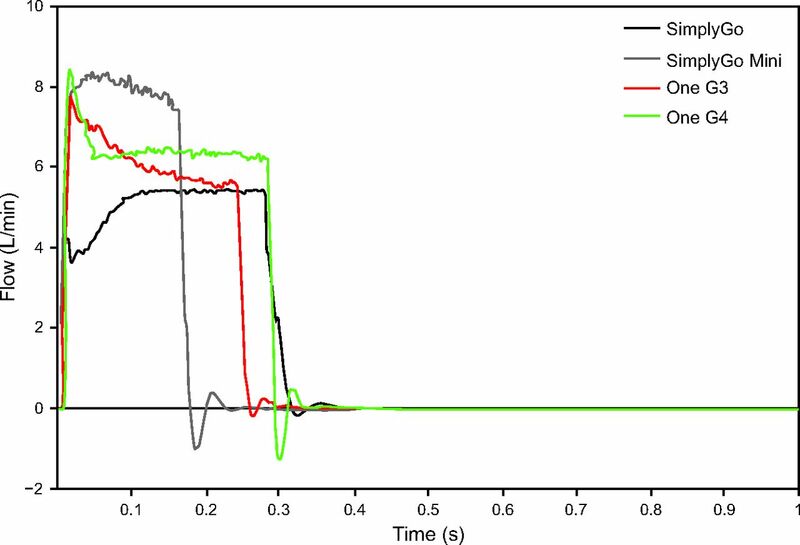 Sample flow and oxygen fraction waveforms generated by the experimental apparatus for pulsed delivery of oxygen. From Reference 10, with permission. 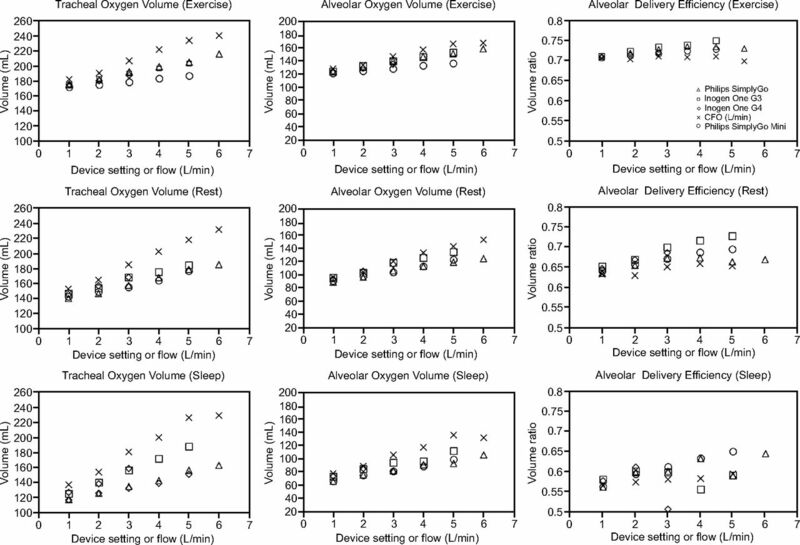 Volume-averaged FIO2 and pulse characteristics for each of the tested portable oxygen concentrators and continuous flow oxygen across 3 breathing patterns. FIO2 values were averaged over 5 consecutive breaths. Other pulse characteristics averaged >20 consecutive breaths. Error bars indicate ±1 SD. 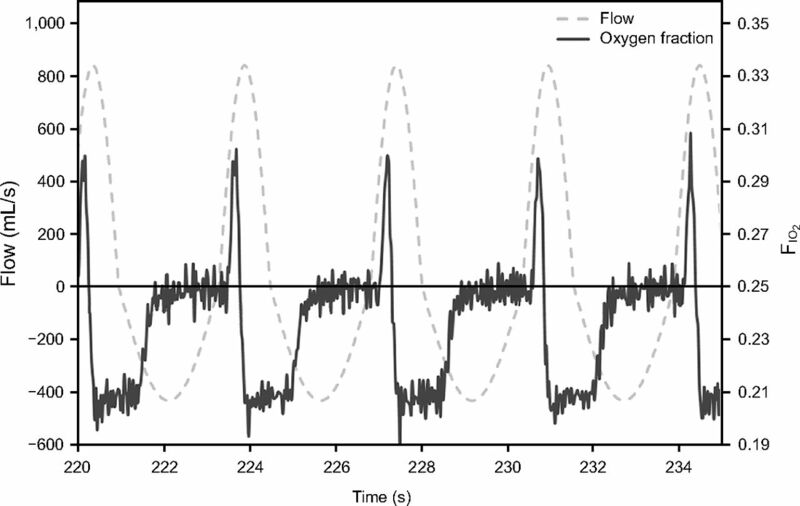 Pulse flow curves generated by the O2 Conserver Testing System for each portable oxygen concentrators (POC) at setting 2 for each device and breathing frequency of 17 breaths/min. 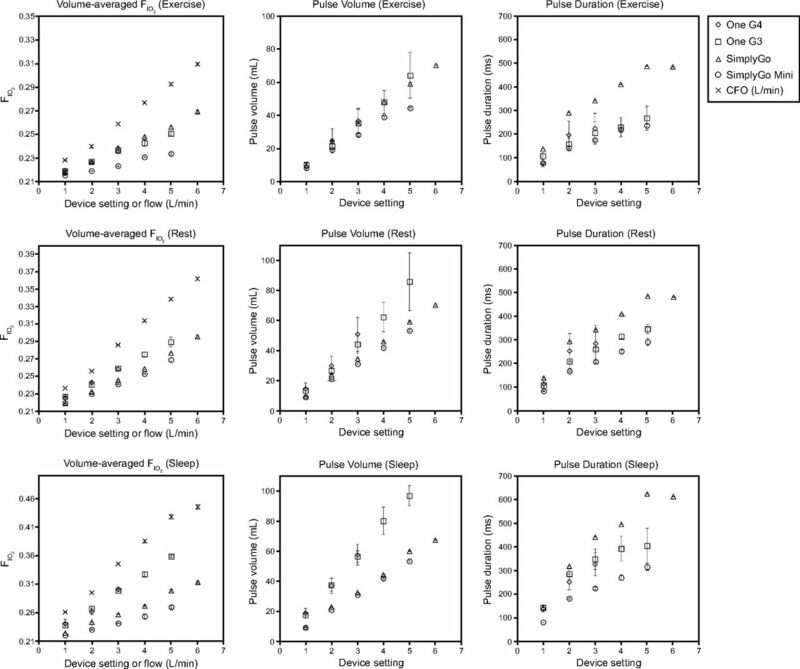 Comparisons of volume-averaged FIO2 measured in airway experiments with volume-averaged FIO2 predicted by using pulse characteristics. 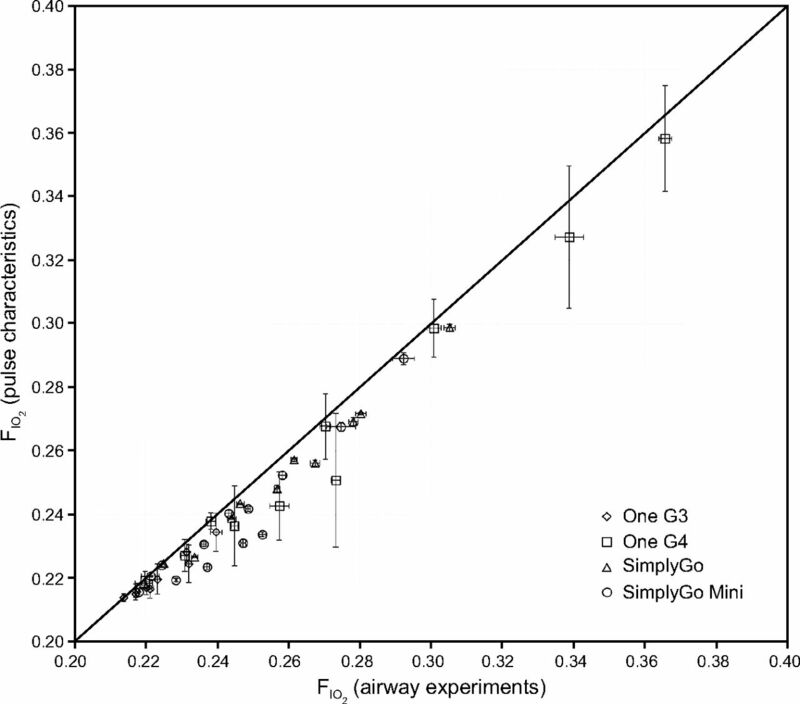 Vertical error bars indicate ±1 SD of FIO2 determined from airway experiments over 5 consecutive breaths. Horizontal error bars indicate ±1 SD of FIO2, determined by using pulse characteristics over 20 consecutive breaths. Identity line shown for comparison. 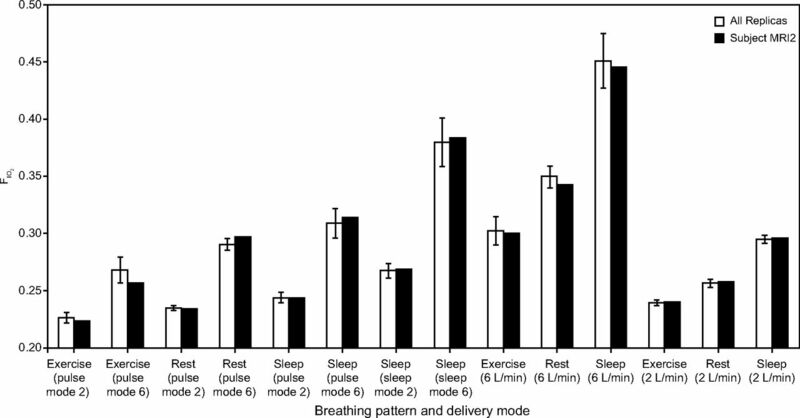 Sample output of MATLAB simulation (SimplyGo Mini, exercise breathing pattern, device setting 5). The trachea line represents oxygen concentration passing the trachea over time determined by the in vitro experiments. Oxygen passing generation 14 enters the gas exchange regions of the lung. 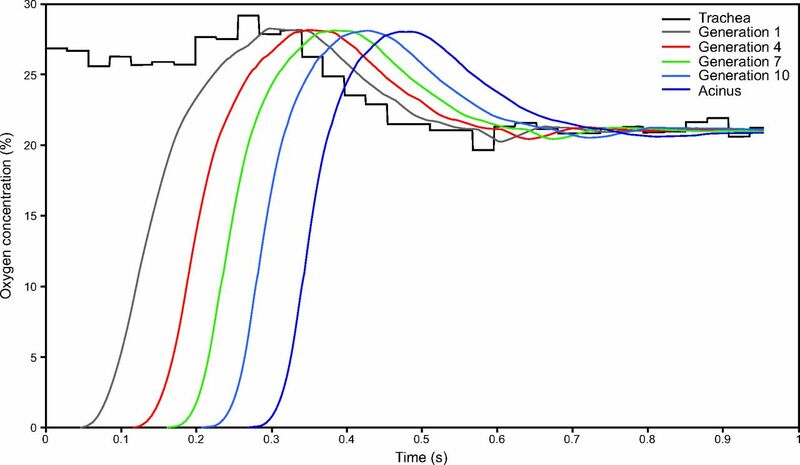 Volumes of oxygen passing through the trachea, passing into the alveolar region, and the ratio of these 2 numbers (ie, a measure of the fraction of the oxygen passing the trachea that reaches the alveolar region) for all tested portable oxygen concentrators and continuous flow oxygen.